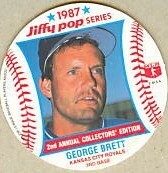 1987 Jiffy Pop disc of Kansas City Royals Hall of Famer George Brett. MINT. ONLY ONE AVAILABLE FOR SALE.